Inspiration for a post today comes from WordPress’ Daily Prompt: Your personal sculptor is carving a person, thing or event from the last year of your life. What’s the statue of and what makes it so significant? Fortunately for this post, we didn’t get a picture of what I have in mind for my statue. 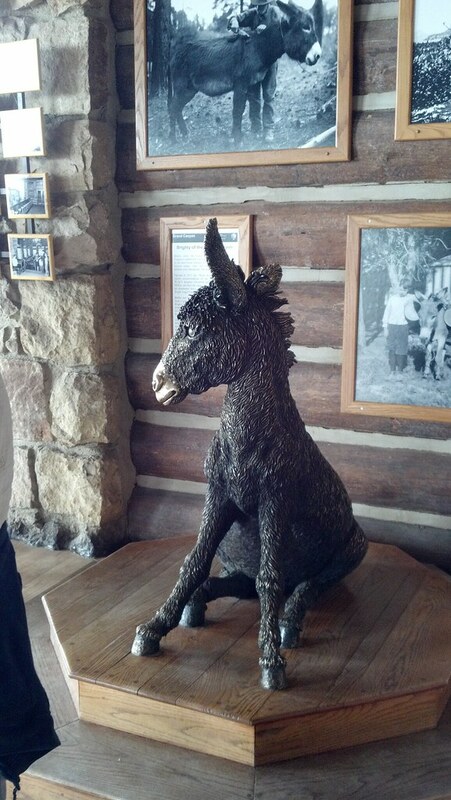 However, the bronze beast above was from the same trip and it provides a nice springboard for discussion of my statue. My statue would be of the National Park Service worker riding a very tall, elegant mule up the North Kaibab Trail, both of whom we passed as we descended down the same trail, into the Grand Canyon. This was on our July trip to the southwest; the main part of it was a 3-day hike all the way down from the North Rim, and all the way back up again. I did not expect to experience this much contrast on a hiking trip! Our high-tech tents; our biological need for water and salt. A trail with a precipitous drop; a helicopter landing pad, not far away. A cotton bandana soaked with creek water; a pack of dehydrated food. Advice to bring a water purification tool; fresh water from spigots along the trail. A babbling, cool creek, less than 20 feet from our tents and baking bodies. Frogs and toads. Spending time with my own brother, and yet discovering, as we all peeled off clothes to slide into a refreshing stream, a old scar on him, which I knew about but had never seen. A pack animal on the trail; his rider with a mobile phone on his belt. The rider carried a shovel; he asked us about our plans, including ones for adequate hydration. Mules were the canyon pack animals (for those who used them): they looked like horses, very tall and with cool grace, but they were mellower (thanks to their infusion of donkey, apparently) than any horse I’ve seen that had to share a narrow trail with any number of unfamiliar humans. This was a year that included: my first Birkebeiner ski race, a really fun ski trip to the Methow valley and the snowiest 3 days I have ever seen in Tacoma, our first winter squash crop, another visit to Kentucky, lots of yoga teaching and a growing clientele, a role change for me at work, my husband’s first trip to Germany, a visit to Zion Park (it was on my bucket list) and the Gunks (they were, too! ), the beautiful wedding of an old friend, new windows on the house, an historic run with my dad, and more. And yet my thoughts keep going back to that Grand Canyon trip. On it, I experienced an amazing place (and effort) with loved ones, I wandered –even dwelled for a spell– outside of my comfort zone in a few ways, and collected countless fond memories that continue to raid my thoughts at strange moments. And, I got to know my brother a little better. He may still be a stinker of a competitor at games like “Sorry!”, but he’s one great leader and companion on the trail. I look forward to more trips like this one.